Yesterday, New Year's Day, I participated in the First Day Hike at nearby Deception Pass State Park. 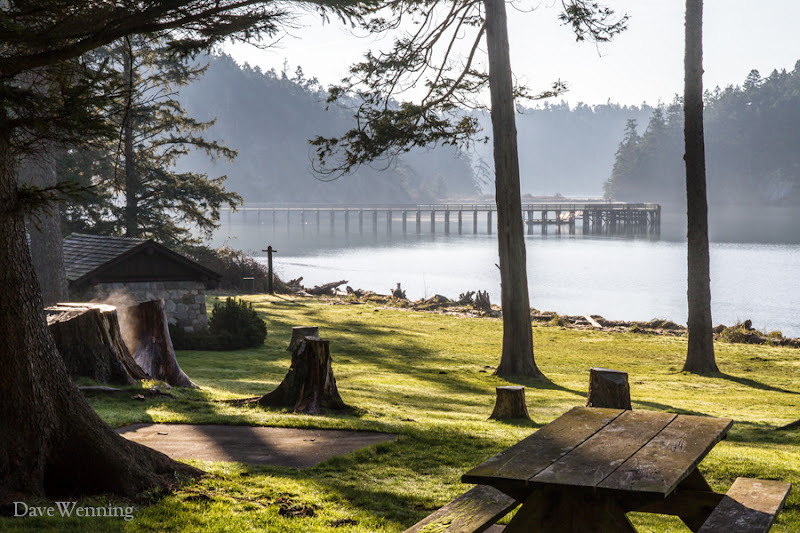 In Washington State, thirteen parks hosted First Day events to kick off the centennial year commemoration of our state park system. 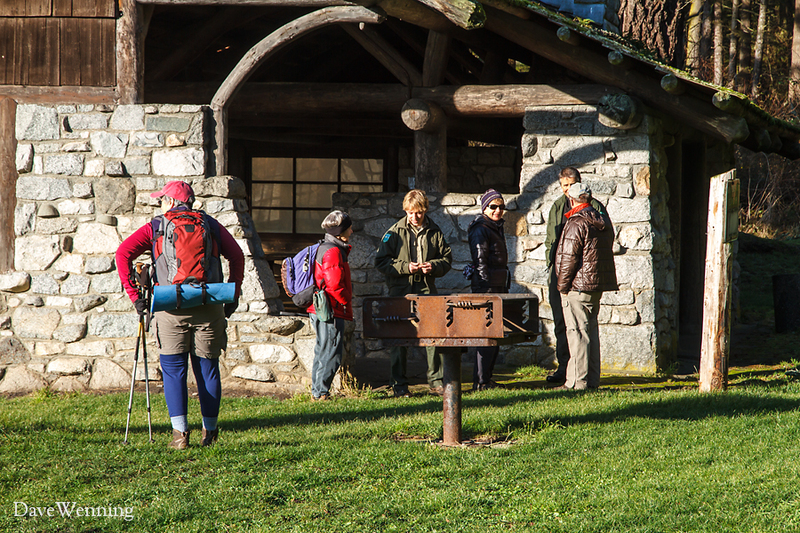 Participants gathered at the kitchen in the Bowman Bay picnic grounds. Our route would be the Bowman-Rosario Nature Trail out to Rosario Head. I arrived early to catch some images of the park in the morning light. It has been a long, dark and wet winter so far. In fact, December, 2012 was one of the darkest on record. New Years Day began with fog throughout the Puget Sound Basin. By mid-morning it was lifting to reveal the most beautiful day we have experienced since the fall. Overnight temperatures had dropped below freezing. When I arrived, the lawns and picnic tables were covered in thick layers of frost. Some lingering haze in the chilly air added a bit of moodiness to the morning light. Beyond Bowman Bay, fog persisted over the Strait of Juan de Fuca obscuring views of the Olympic Mountain Range. Only the tips of the tallest peaks could be seen above the fog bank. Our hosts were Jack Hartt, Park Manager, partly obscured on the right and Sam Wotipka, Park Interpreter in the center. The park was established in 1926. During the 1930's, the Civilian Conservation Corps worked on the site adding many of the facilities still in use today. 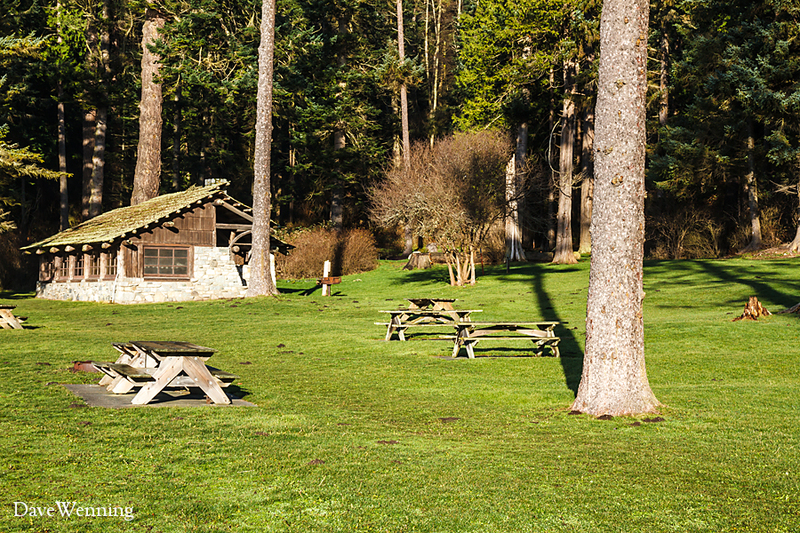 Larrabee, established in 1915, is Washington's oldest state park. It is just up the road a piece from Deception Pass. We became a colorful group in our winter warmies. Before setting off on the trail, we would number fifty or more. The event also gave me another opportunity to get some experience with the new camera and with the raw image format. The trail begins with a brief climb up the cliff on the north shore of Bowman Bay. Along the trail, the group seemed to split between fast movers and slow movers. I was in the fast group. I am not sure what that says about us. It was a chilly day, perfect for a brisk hike. It was a pleasant day to linger and enjoy nature's beauty. 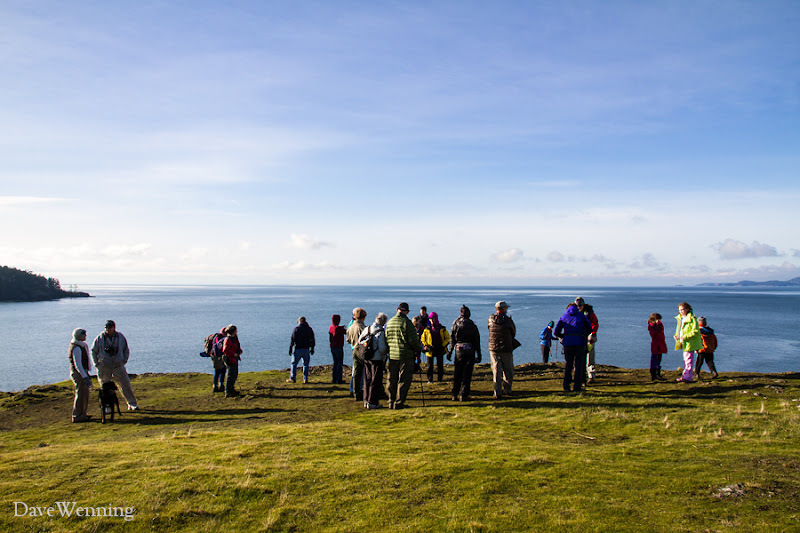 From the top of Rosario Head (above), it is possible to see Vancouver Island, Canada when the weather is very clear. 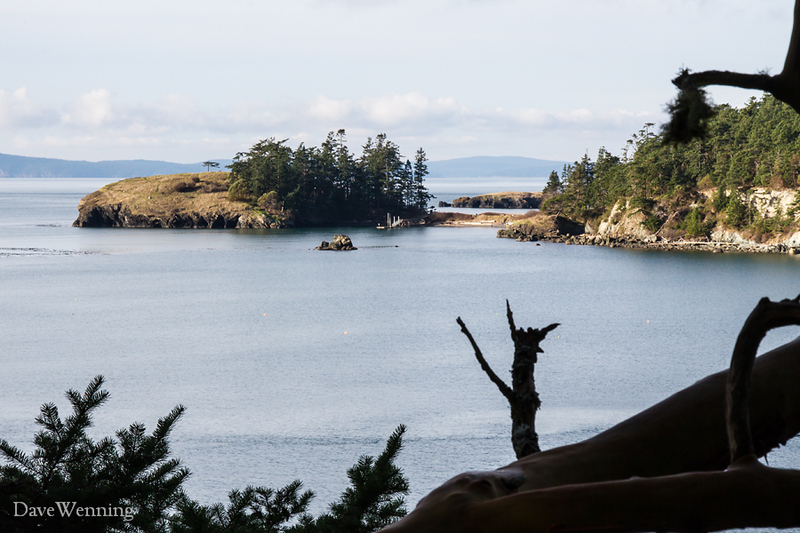 Across Rosario Strait, we were able to spot Lopez Island in the San Juans. 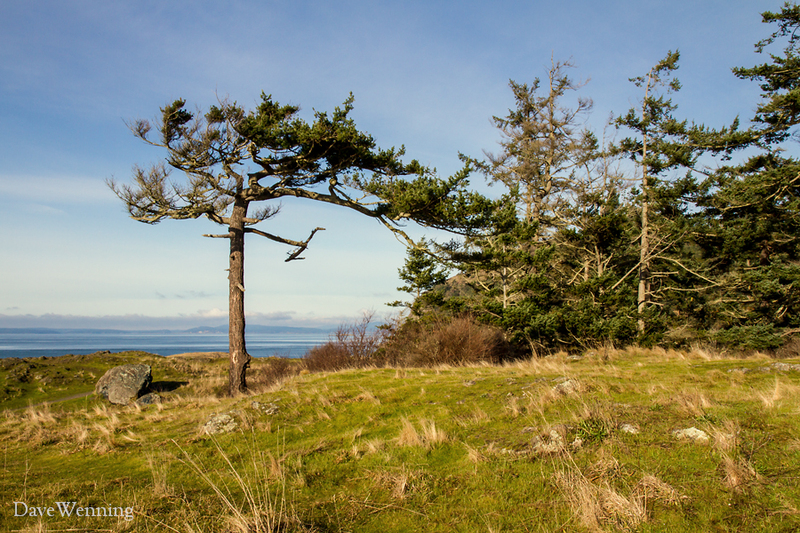 One of the icons of Deception Pass State Park is this weathered Douglas Fir that stands alone in the center of Rosario Head. We know this tree as a giant and an important source of lumber. Here, growing out of solid stone, exposed to drying winds and salty storms, it has become a miniaturized bonsai. The tree is an example of the persistence of living things to survive and reproduce. The park has another very special Douglas Fir that grows in the sand dunes at West Beach. 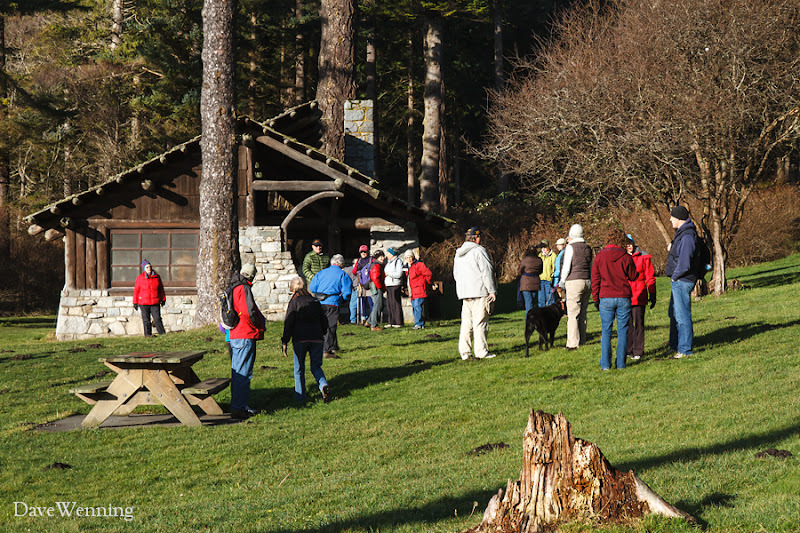 At the end of the hike, we gathered again at the Bowman Bay picnic grounds for coffee, cocoa and doughnuts. 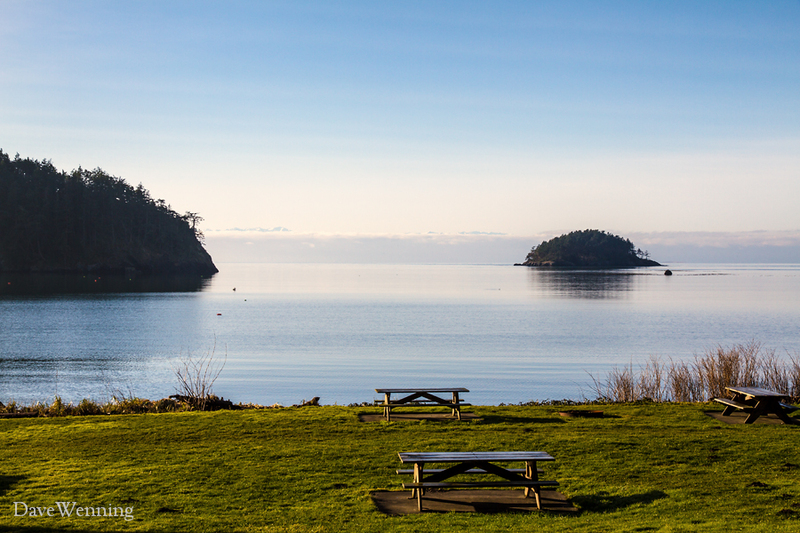 The goodies were provided by the Deception Pass Park Foundation. The event was over, but I wasn't ready to go home yet. 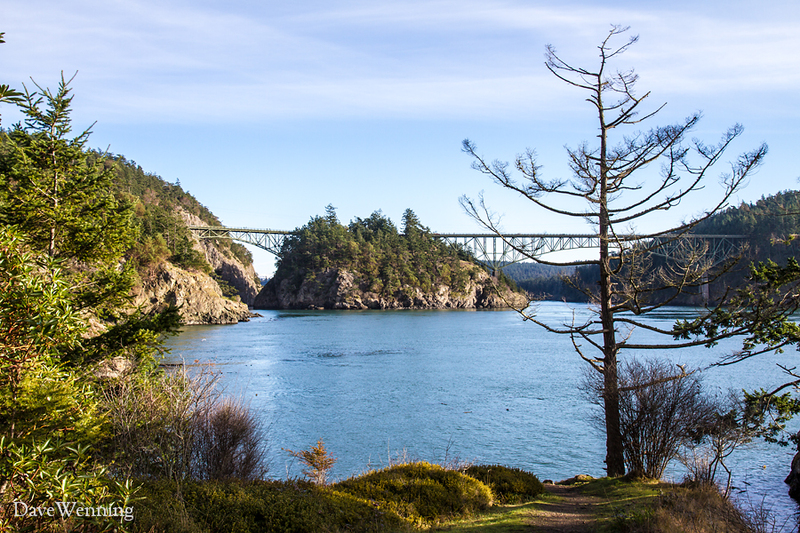 I decided to take a quick walk out to Lighthouse Point on Deception Pass to catch some photos of the bridge. This trail begins with another climb up the cliffs over Bowman Bay. Along the way, I got this shot of Rosario Head, our earlier destination. Click the photo to enlarge it. You can see that iconic Douglas Fir standing apart from the other trees. 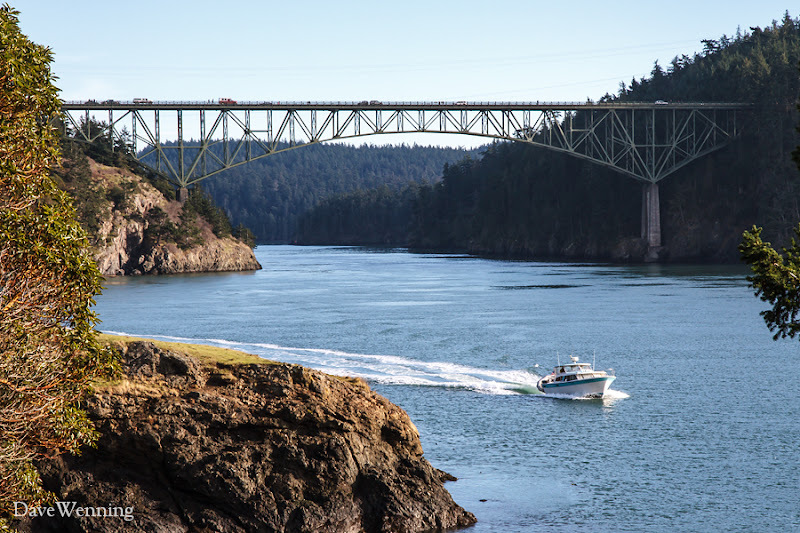 At Lighthouse Point, I found the Deception Pass Bridge in all its glory. It is said to be the most photographed structure in the State of Washington. The waterway is the namesake of the park. It connects the Strait of Juan de Fuca with Skagit Bay which is the northern-most reach of Puget Sound. The bridge links Fidalgo and Whidbey Islands and the two sections of the park. What a perfect day it was to get outside and do the things we love. This was my second First Day Hike at Deception Pass State Park. I am already looking forward to next year. So beautiful! Sorry I had to miss out on this one. Happy new year! Hi Linnea. I thought about you yesterday. Thanks for stopping by.